A college town can be a fun place to live even as an older adult. There are often endless activities to participate in from football and hockey games to concerts and cultural events. And since the students in the area are probably on a tight budget, you’ll likely have access to cheap bars and restaurants. What’s more, college towns tend to have strong economies that surrounding neighborhoods can benefit from. 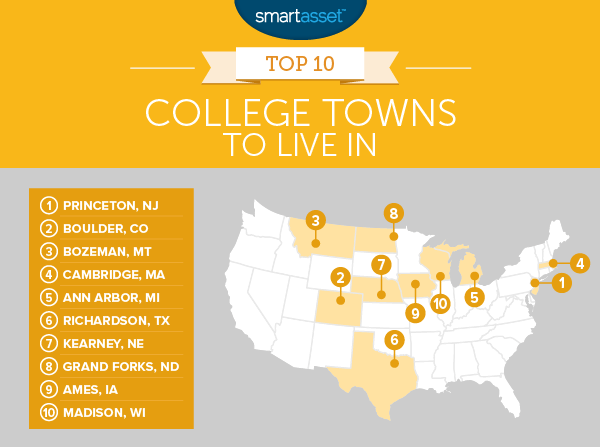 This is SmartAsset’s third annual study of the best college towns to live in. Read the 2015 study here. SmartAsset created a ranking of the best college towns to live in using the five metrics that we considered in the 2015 edition of our study. We looked at the unemployment rate, property crime rate, violent crime rate, housing costs and the median household income in each college town. We also compared residents’ access to dining and entertainment establishments. No major changes. Nine of our top 10 college towns ranked as the best college towns to live in last year. Princeton ranks as the No. 1 college town to live in for the second year in a row. Unemployment rates are down. Of the nine college towns that cracked the top 10 in 2015, seven of them saw their unemployment rates fall. Job markets in college towns tend to be relatively healthy since colleges are major employers and bring a need for other services. Since we conducted the 2015 edition of our study, the unemployment rate in Princeton has fallen by 11.4%. And compared to last year, the average resident has an additional $4,226 left over after paying for housing costs. Besides visiting the Princeton University campus, local residents can check out its historic downtown area, hike along several different trails or go kayaking on Lake Carnegie. Boulder is undoubtedly a college town. Local college students make up 33% of its total population and tailgating is one of its finest traditions. One thing that makes Boulder a great place to live is its housing market. If you’re ready to settle down there and buy a house, you’ll find that homeowners in the metro area face a real estate market with stable growth. The city of Bozeman is located in Gallatin County, Montana. Out of all of the college towns in our study, it has the lowest unemployment rate. According to the Bureau of Labor Statistics, only 2.7% of its population was looking for work between May 2015 and June 2016. Bozeman is surrounded by the Rocky Mountains, so there are plenty of things to do if you’re into climbing or camping. It also has the highest concentration of dining and entertainment establishments in our study. For every 10,000 people, there are nearly 30 restaurants, bars and entertainment businesses. The city of Cambridge was once a farming village called Newtowne. Today, it’s home to some of the best and brightest students in the country. Besides Harvard, other colleges in Cambridge include the Massachusetts Institute of Technology and Lesley University, a private school that offers a number of liberal arts programs and degrees in counseling and education. Some of the wealthiest people in the country live in Cambridge. The median household income is $75,909. Residents spend about 26.8% of their income on housing-related expenses. That’s less than the 30% threshold set by the Department of Housing and Urban Development. For the third year in a row, Ann Arbor ranks as one of the best college towns to live in. More than 10,000 people in the city work for the University of Michigan, which is one of the area’s top employers. When they’re not on the clock, residents can tour breweries, walk through museums or head to the Matthaei Botanical Gardens. According to the U.S. Census Bureau, there are about 17 bars, restaurants and dining establishments for every 10,000 residents. The University of Texas at Dallas is in Richardson, a small town in Northern Texas. It’s one of the 14 institutions in the University of Texas System. Compared to Denton, where the University of North Texas is located, Richardson has a median household income that’s 37.6% higher. Known as the “Midway City,” Kearney sits directly in the middle of the country and was once a popular place for people to pass through on their way to the West. If you’re not a student at the University of Nebraska – Kearney, you’ll find that it’s a relatively inexpensive place to live. A typical resident spends just 19.4% of their income each year on housing costs. Grand Forks is located at the fork where the Red River and Red Lake River meet. That’s where the town gets its name. It’s the third-largest city in North Dakota and it has the second lowest unemployment rate in our study. Ames is about 30 miles from Des Moines. The city has one of the lowest crime rates in our study and students from Iowa State University make up a whopping 56% of its population. But Ames is more than just a college town. Its strong labor market makes it an attractive place for people looking for new jobs and career opportunities. Madison is a fairly young town. The median age is 30.8. In addition to being one of the best college towns in the country, it ranks as one of the best state capitals to live in. The University of Wisconsin-Madison plays a major role in the community. Local residents often turn out in big numbers for sporting events, like basketball games. To find the best college towns to live in, SmartAsset pulled data for all of the U.S. cities and towns with at least 25,000 residents and at least one four-year college or university. Then, we looked at the total number of college students enrolled in local schools and focused on the towns where students made up more than 20% of the total population. Once we ranked all 126 college towns using these factors, we averaged our rankings, giving full weight (100%) to three of our metrics. We created a single overall crime ranking by giving 30% weight to property crime and 70% weight to violent crime. Finally, we gave each of our college towns a score between 0 and 100. Since none of the college towns ranked first across all of our metrics, the best ranking college town scored an 87 and the lowest ranking college town scored an 8.34. Unemployment rates come from the Bureau of Labor Statistics. Crime data comes from the FBI’s Uniform Crime Reporting database and local crime reports. Data on dining and entertainment establishments, housing costs and median household income comes from the U.S. Census Bureau.